Put aside any stereotypes you may have about Indian food when dining at Saha Signature Indian Restaurant & Terrace Bar, because the restaurant’s unconventional cuisine will surprise your palate. 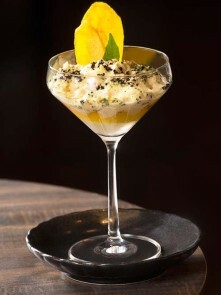 The Indian fine dining restaurant, headed by chef Abhijit Saha, prides itself on serving “innovative” Indian cuisine which integrates modern culinary techniques (read: molecular gastronomy) with non-traditional ingredients, like exotic mushrooms. But how does that really translate into actual food? I would find out soon enough. My dining companions and I started our meal innocently enough with a complimentary appetiser of papadum (thin, large crackers) and dried bananas with freshly-made tangy mango chutney and sweet papaya relish. Still not too far off from traditional Indian cuisine, we thought. 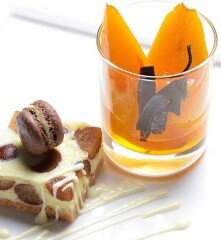 However, the next amuse bouche, a thin, icy mango popsicle, set the tone for the rest of the meal. Savoury instead of sweet, the popsicle was an interesting departure from the usual sugary versions many are used to. Made with a tinge of cumin, the ice pop’s flavours were complex and even a little spicy, which we liked. Next up was the Kerala Vegetable Stew Espuma ($16), where blended Kerala stew was dispensed from a liquid nitrogen cylinder, foam-style, into a Margarita glass and garnished with homemade banana chips, garlic crumbs, black olive powder and extra virgin olive oil. While the Kerala spice flavours were kept in the avant-garde dish, its textures were refreshingly light and not as dense as regular curries, making it seem like an almost guilt-free experience. 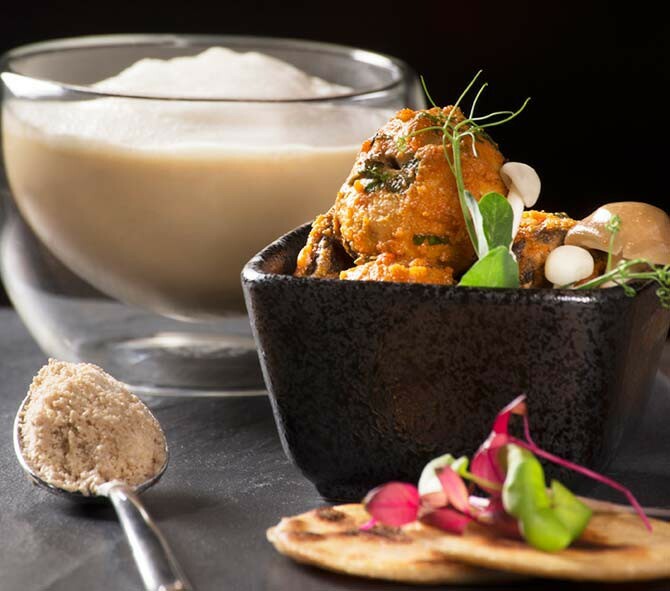 The next dish, the Tasting of Mushroom ($18), an unusual combination of masala cappuccino mushroom soup, grilled tandoori mushrooms and a spoonful of frozen masala mushroom ice cream — again, made with liquid nitrogen — fared well with us too. While the soup had the comforting, earthy taste of mushrooms, the star of the dish was the grilled mushrooms, comprising shiitake, button, shimeji and gucchi mushrooms. The mushrooms were flavourful and had a nicely-balanced, fiery kick. Gucchi mushrooms, as we found out from the chef, are exotic mushrooms from the Himalayas, costing about $1,500 per kilogramme. Our meal ended on a sweet note with the Gulab Jamun Cheesecake ($15), where the popular Indian sugary ‘doughnuts’ were given a Western interpretation and baked within a dense, velvety cheesecake.